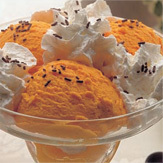 The SHARON FRUIT is a delicious exotic fruit, sweet and seedless. It is eaten hard like an apple. 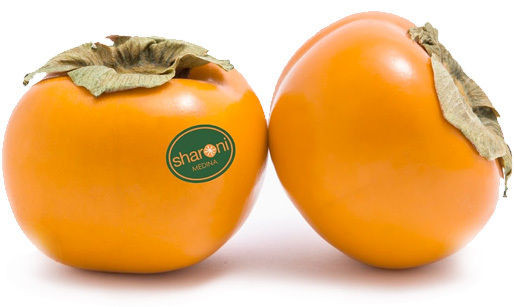 The SHARON FRUIT is nourishing; in addition to its nutritional value it can also improve your health and prevent or reduce the risk of diseases. It is rich in antioxidants. 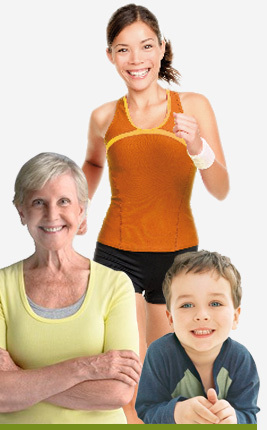 Scientific research shows that an optimal intake of anti oxidants prevents or slows down the development of degenerative diseases. SHARON FRUIT is a good source of carbohydrates and proteins; it contains these in such right quantities that make this kind of fruit an essential part of a healthy diet. 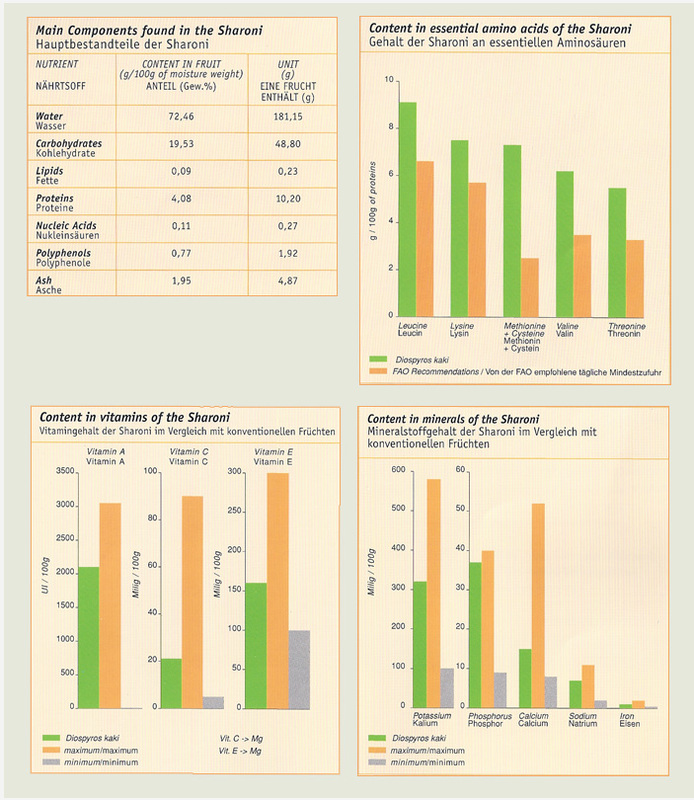 It is rich in essential amino-acids with excellent antioxidant properties due to its high levels of vitamins A and C. It is also high in phosphorous and specially potassium. Peel and chop the sharon fruit and the other fruit and put the pieces on a plate. 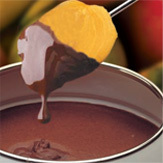 Melt the chocolate in a bain-marie and heat it in a fondue pot. Serve the two together and eat while still hot. 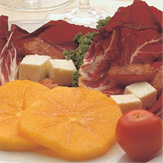 Chop the salad vegetables, slice the tomato and the sharon fruit and place them on the plate. Add cubes of the goats’ cheese. Season with salt and pepper and a little oregano. Add olive oil when serving. 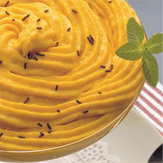 Peel and mash the sharon fruit. Add them gradually to the container in which the sugar, Kirsch and water are being mixed together, until a smooth mixture is formed. Put the mixture in a mould and place in the freezer. 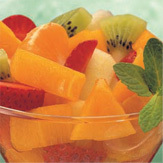 Peel and chop the fruit into cubes, place in a deep glass and drizzle the orange juice over it. Add a little mint to decorate. Cook the rice and rinse it. Melt the butter in a frying pan and brown the rice, add the raisins and cinnamon. 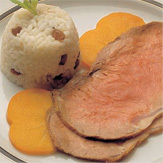 Serving suggestion: Slice the sharon fruit and place at the bottom of a shallow dish, place the slices of roast beef over them. Mould the fried rice into a shape and serve on the same plate. Melt the jelly with 50dl of water in the microwave. Beat the egg yolks and sugar together and beat the egg whites until stiff. In a bowl, mix the water and jelly with the cream, the mashed sharon fruit, the beaten egg yolks and sugar and the egg whites. Beat until the mixture comes together. Wash and chop the salad vegetables and use them to layer the bottom of a dish. 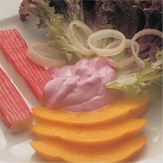 Add the onion cut into rings, the sliced sharon fruit and the crab sticks. Serve the salad with cocktail sauce. Make a syrup using the water and sugar and leave it to cool (1 hour approx.) Mash the sharon fruit. 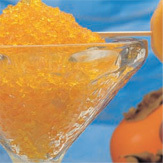 Mix the mashed sharon fruit with the lemon juice, put it in the freezer, removing it a number of times to mix, in order to get the slushie texture.